Vegan Version of Eat This, Don't Eat That "Healthy Food"
The authors, David Zinczenko and Matt Goulding, of the book Eat This, Not That! Supermarket Survival Guide, discuss the most "misunderstood 'health' foods in America." The article was OK, but sometimes the nutritional reference points are a bit skewed. I don't think that saying Turkey Burgers and Pasta Primavera are 'bad' choices is really a helpful tip. Here is my Vegan Version of what "healthy foods" to shun and what to eat instead. Vegan Version of what new "healthy foods" to shun and what to eat instead. DO EAT: 100% Fresh Juice! Do you really think that you are doing your body 'healthy' if you are drinking reconstituted fruit and veggie juices? Does reconstituted sweet potato juice actually sound appetizing to you? I personally think it sounds horrid. All the enzymes and many of the nutrients found in fresh juices will be absent in this shelved, plastic bottled juice. I'm not a fan of the deceptive 'healthy' marketing of this V8 juice. Stick to fresh pressed juice. Or heck, even drink Odwalla or Naked bottled juices. At least they are refrigerated and not from concentrate. 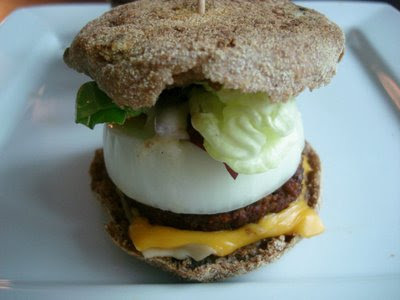 DO EAT: A vegan do-it-yourself breakfast sandwich, shown in photo above. The commercials are cute. The sad moon-man who is half-full and needs to rise full any minute. Jimmy Dean Delights to the rescue! But the 'healthy-marketed' Jimmy Dean sandwich actually has around 3 grams of saturated fat. That's 15% your RDA. And with 6 grams of fat total, you don't want to get in a habit of starting your day with one of these. Go vegan-style and get all the taste (and more flavor) without the added fat and chemicals galore in the ingredients list. Get the Vegan breakfast sandwich recipe here- Giggling Morning Muffin. Go for high quality, made fresh to order pizza. Better taste, better for your pizza-loving spirit. For more on why the Pizza Hut Natural Pizza is not as 'healthy and natural' as they claim, read my post, Pizza Hut Goes Au Natural, What Was it Before? DO DRINK: Fresh juice, see #1 above. Motts Kids "health juice" may have added vitamins and minerals, but the calorie content is still very high. There are 128 calories in 8 ounces of juice. That is more than in one whole fruit apple. Juice: 32 grams carbs. If you are going to drink juice for its nutrition properties, go for freshness first. With all this fresh juice talk, perhaps you should consider doing your own at-home juicing. Read at-home juicing 101.